So you have hardwood floors and you’re wondering which baby push walker would be best? Truth be known, it is always better for your baby to start out on carpet or grass if at all possible because they are inevitabily going to fall. But once they get going and get used to the walker, then you’ll want one which is sturdy enough that it grips on your hardwood and also doesn’t leave marks or make too much noise. Here is the fact: A baby walker is a great investment when your baby begins to walk or stand. Experts advise any parent out there, to choose a push walker that provides support for their baby and one that incorporates interactive and learning games within the walker. This way, your baby will not only learn how to walk as he or she lean or push the walker around the house, but they will also improve their motor skills. There are quite a lot of options when it comes to choosing a good walker, so let us show you four of the best push walkers for babies in the market to help you narrow down your selection. The Melissa and Doug Deluxe Push Toy is unique and one of a kind. 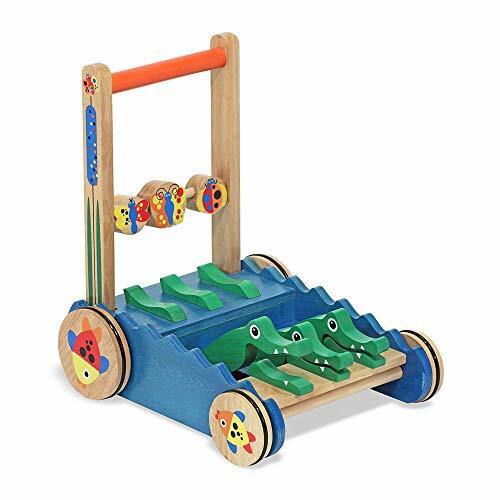 It’s a solid wood push toy, beautifully styled, mainly designed to be pushed by a child learning how to walk or how to keep balanced. Three alligators will chomp along as your baby walks making it a very fun and entertaining walker. This toy has beautiful colors that make it very attractive and engage your child at all times. Because it is one of the more sturdier models offered and has rubber strips on the wheels, this walker has received good reviews for those using it on wooden floors. It also doesn’t leave any marks on the floors and is fairly quiet when your baby is using it. The three green gators in a blue pool offer a perfect walking companion to your little one, while the four non-skid wheels (with colorful fish) allows them to push along without moving too fast. This minimizes the chance of falling or leaving unsightly marks on your floor. The handle is wooden, easy to grab and feels good to hold even along wandering paths. The beads on the handle support and help improve fine motor skills while the alligator’s noise, as well as animation, encourages movement to help the development of gross motor skills. The toy features a broadly designed base to prevent a child from tripping over and falling. It’s painted with non-toxic paints so you won’t have to worry about the safety of your baby. Some parents have complained that the paint on the handle rubs off onto their baby’s hand, however, the paint can be easily washed off. This is a point worth considering, but as a general tip you can sand the paint off the handle if necessary. Do you have a limited budget? Well, Fisher-Price Scoop is one of the most inexpensive baby walkers you will come across. The only word to describe it is that it’s a toy that makes an addictive popping sound, giving new elements of fun to a walking baby. 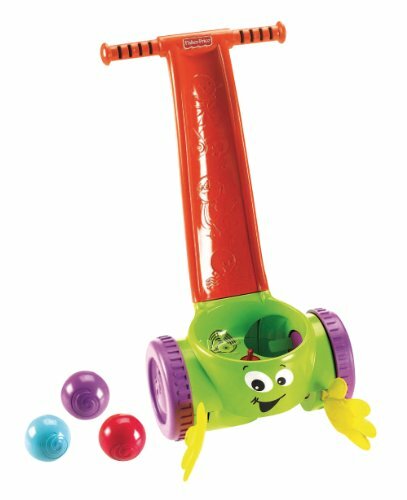 When pushing the toy, there are balls that whirl around the bowl then pop out to encourage your little one to chase after them, allowing them to think of cause and effect. The other great benefit about this popper is that it’s easy to push, therefore encouraging toddlers to walk and also develop balance and coordination. There is an easy to grasp handle for small hands to push and pull, but it’s highly recommended that you buy this walker for children between the age of one and two years or those that are already steady on their feet. This is because the unit doesn’t have four wheels that can offer stability for beginners. While this toy provides a lot of fun, you have to be prepared for the noise it will create when in use. 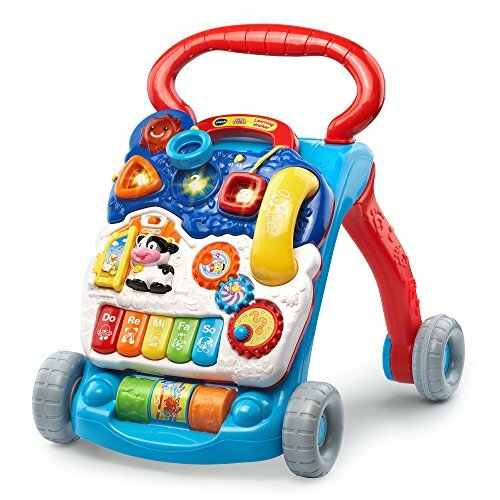 Vtech push walker is on our list for three great reasons; One, it offers incredible play panels with music, different sounds, buttons, telephone handsets and other entertainment to keep your little one active at all times, and the good thing about this panel is that it’s detachable. Two, unlike other push walkers, Vtech allows your baby to push in a shopping style both on hard and soft surfaces. This not only makes pushing interesting, but also stabilizes the child as he or she walks for the first time. However, be aware on hard surfaces since the pushers’ settings may not entirely keep the wheels from sliding. There is a rubber seam on the rear wheels that can prevent side to side motion, still, you need to supervise your little ones. Lastly, Vtech wheel system is designed in a way that caters to different toddler ages and different walking styles. One setting lets the wheels move freely, while the other setting makes it difficult to turn. Other than those three great features, this push walker is durable, easy to assemble, functional and most importantly is a lot of fun for your baby. 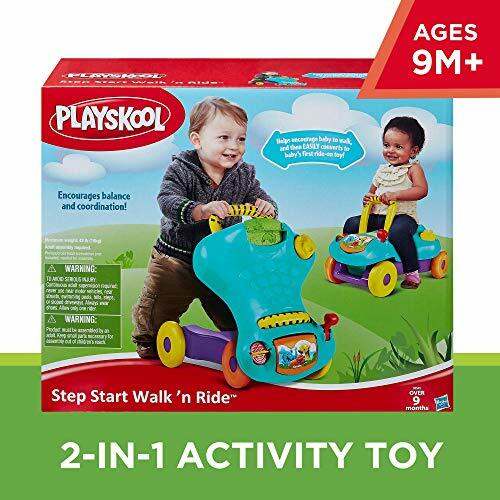 Playskool Step Start Walk’n Ride is one of the best push walkers for babies over the age of nine months. It’s a simple 2-in-1 toy with a clicking dial and a locking mechanism that keeps your baby safe at all times. This baby walker features a convenient-to-hold handle giving a child a firm grip, therefore, allowing the child to maintain their balance. The wheels are perfectly sized to allow your baby to maneuver on most surfaces. However, a few parents have expressed their dissatisfaction on how the toy maneuvers on hardwood floors, claiming the wheels just slid. The good thing is that this toy doesn’t turn that fast, so chances of slipping are minimal. This walker is a lot of fun and will be a go-to toy even after he or she has learned to walk. It also features a spinner, an antenna, a room for storing other toys and a clicking gearshift. These are the best push walkers for babies you will find on the market today. The most important factor when shopping for a baby push toy is the safety features of the toy. With proper supervision, having your baby start to walk with one of these toys is pure joy both for baby and parent. No safety features are foolproof, so it’s important to ensure that your child uses the push toy properly and on the right surface. The baby walkers we reviewed in our article all allow freedom of movement and will keep your baby stimulated and interested in the toy. At the end of the day, along with safety, these are the most important features to be aware of before your purchase.